ALISO VIEJO, Calif. — RJK Ventures LLC, an industry innovator and leader in handgun storage is pleased to announce today that the new 6-Gun Armory Rack is now made in the USA. 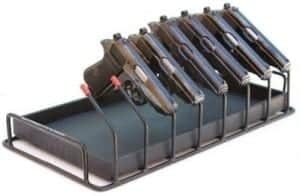 After more than three years of being produced overseas, manufacturing of the existing product line of handgun racks is being moved to the USA over the next year. RJK Ventures LLC is committed to bringing you quality made products right here in the USA. We believe in making a difference on the issues our customers and communities care about and look to do our part in creating more American jobs by supporting more American manufacturing. © 2014 RJK Ventures LLC. All Rights Reserved. 2014 RJK Ventures, the RJK Ventures logo. Armory Racks and the Armory Rack logo, are trademarks of RJK Ventures LLC, in the United States and/or in other countries. Other brands, products, or service names mentioned are or may be trademarks or service marks of their respective owners. Notice: This content is for informational purposes only and does not set forth any warranty, expressed or implied, concerning any equipment, equipment feature, or service offered or to be offered by RJK Ventures LLC. RJK Ventures LLC reserves the right to make changes to this document at any time, without notice, and assumes no responsibility for its use. This informational document describes features that may not be currently available. Contact a sales office for information on availability. RJK Ventures LLC is neither a firearms dealer nor buys-sells firearms.